Mile Post School Room is currently available through December 31, 2019 - Please check back on December 1st, after 12pm, to reserve room time for January 2020 through December 2020. 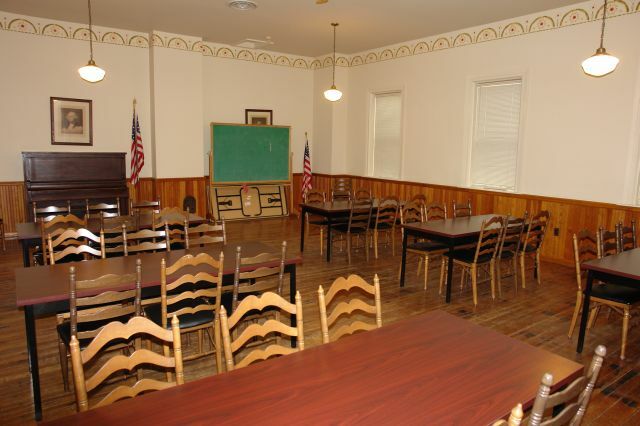 Meetings/Parties Facility Capacity: 20 Room Dimensions: 29' x 29' The Mile Post School is a historic building, which is now used for small group meetings and parties. Parking is limited and only allows for 10 cars. Please do not park on Pittsford Mendon Road. Rooms are currently available through June 22, 2019. Please check back on June 1, 2019 after 12 pm to reserve room time for July and August 2019. Activity room, maximum capacity 36. Tile flooring. Room size: 895 square feet No tape, nails or staples are allowed for use on walls, tables or other equipment. Rooms are currently available through June 22, 2019. Please check back on June 1, 2019 after 12 pm to reserve room time for July and August 2019. Activity room, maximum capacity 36. Tile flooring, sink. Room size: 820 square feet No tape, nails or staples are allowed for use on walls, tables or other equipment. Rooms are currently available through June 22, 2019. Please check back on June 1, 2019 after 12 pm to reserve room time for July and August 2019. Activity/Meeting room, maximum capacity 42. Hard wood floor, sink. The room set up cannot be changed. Room size: 796 square feet Functions: Meetings. No tape, nails or staples are allowed for use on walls, tables or other equipment. Rooms are currently available through June 22, 2019. Please check back on June 1, 2019 after 12 pm to reserve room time for July and August 2019. Classroom, maximum capacity 48. Carpeted. Room size: 882 square feet Functions: This room is available for meetings only. Food, paints, glue & adhesives are not allowed. No tape, nails or staples are allowed for use on walls, tables or other equipment. Rooms are currently available through June 22, 2019. Please check back on June 1, 2019 after 12 pm to reserve room time for July and August 2019. Classroom, maximum capacity 30. Carpeted. Room size: 556 square feet Functions: This room is available for meetings only. Food, paints, glue & adhesives are not allowed. No tape, nails or staples are allowed for use on walls, tables or other equipment. Rooms are currently available through June 22, 2019. Please check back on June 1, 2019 after 12 pm to reserve room time for July and August 2019. Classroom, maximum capacity 24. Carpeted. Room size: 466 square feet Functions: This room is available for meetings only. Food, paints, glue & adhesives are not allowed. No tape, nails or staples are allowed for use on walls, tables or other equipment. Rooms are currently available through June 22, 2019. Please check back on June 1, 2019 after 12 pm to reserve room time for July and August 2019. Classroom, maximum capacity 30. Carpeted. Room size: 561 square feet Functions: This room is available for meetings only. Food, paints, glue & adhesives are not allowed. No tape, nails or staples are allowed for use on walls, tables or other equipment. Rooms are currently available through June 22, 2019. Please check back on June 1, 2019 after 12 pm to reserve room time for July and August 2019. Multi Purpose room, maximum capacity 44. Carpeted. 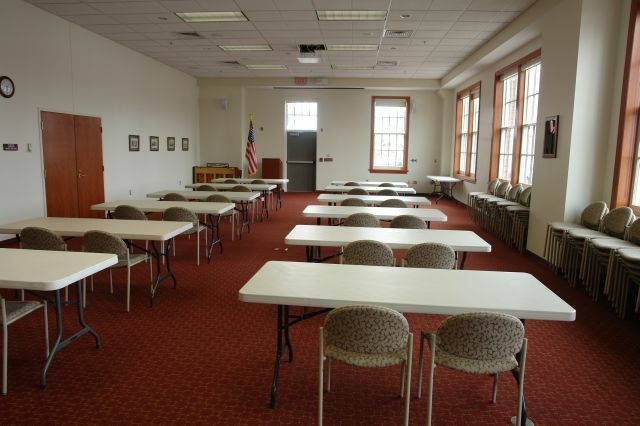 Room size: 894 square feet This room is available for meetings & activities. Food, paints, glue & adhesives are not allowed. No tape, nails or staples are allowed for use on walls, tables or other equipment. Rooms are currently available through June 22, 2019. Please check back on June 1, 2019 after 12 pm to reserve room time for July and August 2019. Large meeting room set up with 8 foot circular tables. The room set up cannot be changed. No tape, nails or staples are allowed for use on walls, tables or other equipment. Rooms are currently available through June 22, 2019. Please check back on June 1, 2019 after 12 pm to reserve room time for July and August 2019. Meeting Room Capacity: 150 Room Dimensions: 32' x 56' Applicant will be required to do his or her own setup if reservation is made within 48 hours of the time requested. Equipment will not be available for late requests. Fisher Meeting Room is available for meetings and lectures; No parties allowed. Rooms are currently available through June 22, 2019. Please check back on June 1, 2019 after 12 pm to reserve room time for July and August 2019. Meeting Room Capacity: 14 Room Dimensions: 32' x 56' Meeting Room Capacity: 14 Room Dimensions: 14' x 29' The Fletcher Steele Room does not allow for special setups. 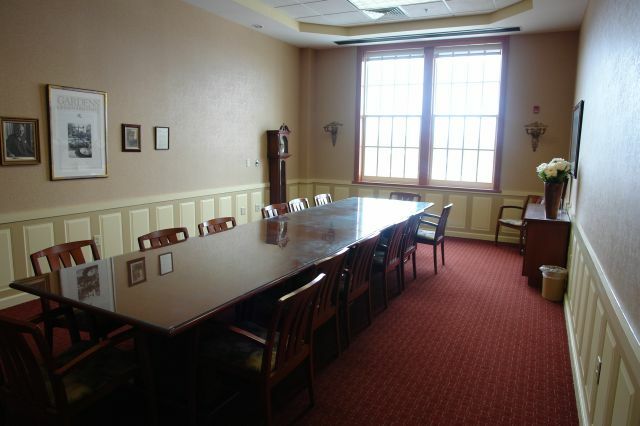 The room includes a conference table and 14 chairs. Equipment will not be available for late requests. Fletcher Steele Room is a formal board room; Adult use only. 90ft, 70ft, & 60ft Base Paths Skinned (All Dirt) Infield Movable 10 Inch Mound All Town of Pittsford parks close at dark. 60 ft Base Paths Skinned (All Dirt) Infield Movable 6 Inch Mound All Town of Pittsford parks close at dark. 60 ft Base Paths Skinned (All Dirt) Infield All Town of Pittsford parks close at dark. 60 ft Base Paths Skinned (All Dirt) Infield, Fenced Field All Town of Pittsford Parks Close at dark. Rooms are currently available through June 22, 2019. Please check back on June 1, 2019 after 12 pm to reserve room time for July and August 2019. Multi purpose room, maximum capacity 30. Wood floor & ballet barres. Room size: 811 square feet Functions: This room is available for dance or fitness only. There is no furniture in this room. No tape, nails or staples are allowed for use on walls, tables or other equipment. Group activities are subject to the submittal of general liability insurance naming the Town of Pittsford as additional insured. Rooms are currently available through June 22, 2019. Please check back on June 1, 2019 after 12 pm to reserve room time for July and August 2019. Multi purpose room, maximum capacity 50. Wood floor & ballet barres. Room size: 2008 square feet Functions: This room is available for dance or fitness only. There is no furniture in this room. No tape, nails or staples are allowed for use on walls, tables or other equipment. Group activities are subject to the submittal of general liability insurance naming the Town of Pittsford as additional insured. Gazebo is currently available through 2019 Meetings/ Parties Facility Capacity: 50 Room Dimensions: 38' x 37' Village of Pittsford. There is substantial parking available. Lodges are currently available through 2019. Meetings/ Parties Facility Capacity: 99 Room Dimensions: 55' x 28' King's Bend Park North Lodge is located on Jefferson Road, east of the Village of Pittsford. The lodge is perfect for birthday, graduation and other family parties. Some of the amenities in the lodge include, a sink, refrigerator, oven, bathrooms and a fireplace. There is a playground in the park and two small ponds. There is substantial parking available. Lodges are currently available through 2019. 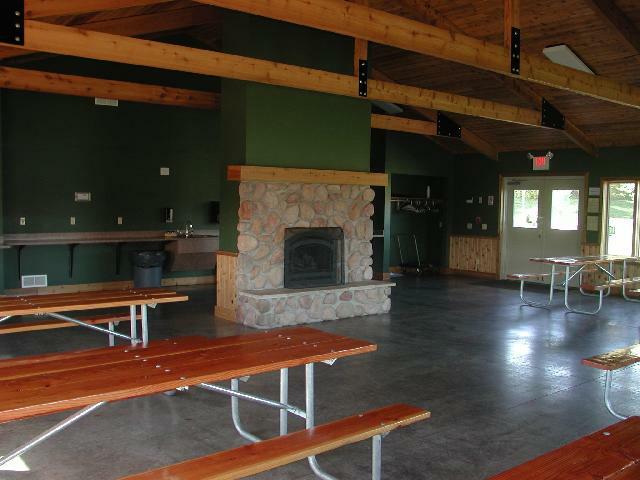 Meetings/ Parties Facility Capacity: 50 Room Dimensions: 38' x 37' King's Bend Park North Lodge is located on Jefferson Road, east of the Village of Pittsford. 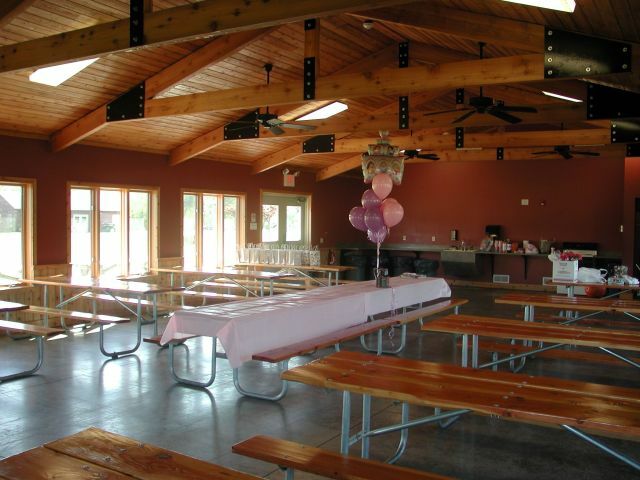 The lodge is perfect for birthday, graduation and other family parties. Some of the amenities in the lodge include, a sink, refrigerator, oven, bathrooms and a fireplace. There is a playground in the park and two small ponds. There is substantial parking available. Pavilion is currently available until November 2019. Multi-purpose Turf Rectangle. Lined Field for Soccer, Lacrosse, and Field Hockey Lined for Soccer (Dimensions 345 x 210) Including Soccer Goals All Town of Pittsford parks close at dark.